A first step to stimulating entrepreneurship among the young people we are working with as youthand student is mapping and measuring the existing entrepreneurial ecosystem in our country and exchange the best practices among ourselves. The purpose of this analysis is to identify learning, development and funding opportunities for young people who want to launch their start-ups or social projects. We will collect all the data from 9 different countries and publish it in only one guide. 3. the evolving culture and attitudes. The government is very supportive. In Estonia, we have so-called startup visa. The Startup Visa helps non-EU founders grow their startup in Estonia. It also makes it easy for Estonian startups to hire non-EU talent. https://www.startupestonia.ee/visa . In addition, most organizations have cooperated with the universities and offered lots of financial support and internship relating to entrepreneurship. We also have STARTER programme that helps to teach entrepreneurship to students. UT IdeaLab is one of the members but there is also Tallinn University, Tallinn University of Tehcnology, Estonia Lifescience University and Estonian Academy of Music and Theatre. 5 partners organise programmes in Tallinn, Tartu, Pärnu and Narva to help students work on their business ideas. We have many incubators for early-stage startups all over Estonia. Many of them receive financial support from the government. In bigger cities, there are plenty of opportunities. In regular areas not so much. But if a person goes to the university he/she will get access to free entrepreneurial education and in Estonia, most courses are offered for free to Estonians with lots of scholarship offers also for international students. http://www.estban.ee/ and https://startupwiseguys.com/ The laws are ok, the government is supportive and Estonia is a small country that its a perfect place to test out your idea before scaling. 8. Few private companies that support entrepreneurial education through Corporate Social Responsibility programmes, hackathons, accelerators. 12. Top 3 cities who have an encouraging climate for entrepreneurs? There are lots of students and young minds in these areas with a mix of international students from different countries. 13. 3-5 projects/programmes initiated by non-profit organisations with the topic: social entrepreneurship and entrepreneurial education. Firstly, a general idea and description of Economical history of Macedonia: – Since its independence in 1991, Macedonia has made progress in liberalizing its economy and improving its business environment. Its low tax rates and free economic zones have helped to attract foreign investment, which is still low relative to the rest of Europe. Corruption and weak rule of law are significant problems. Some businesses complain of opaque regulations and unequal enforcement of the law. Macedonia scores 37 on Transparency International’s Corruption Perceptions Index (ranging from 1–100, with 100 representing the ‘most clean’), which is low compared to many other Balkan countries (Slovenia: 61, Croatia: 49, Montenegro: 45). Unemployment has remained consistently high at about 23% (2016–2017), compared to the average among the EU candidate countries: 16.5% (Albania, Montenegro, Serbia, Turkey). The National Strategy for Start-Ups Development- Macedonia has made limited progress on developing its institutional framework for Start-Ups. The previous National Development Strategy for Start-ups and small and medium business (2011–2013) has expired, but while the new development strategy has been drafted, it is still pending approval. Several reform activities have been implemented to stimulate the development of entrepreneurship in the following areas: simplification and reduction of taxes, quick and simple registration of new businesses, simplification of administrative procedures (such as filing taxes), reduction of costs, procedures and documents for doing business and facilitating access to investment (by creating an innovation fund, for example). At present, the priority of the economic policies of the government is to increase the competitiveness of the Macedonian economy. The following national strategies relate to small and medium business development: Regional Development Strategy 2009-2019, Strategy for Development of Crafts 2012-2020 and Innovation Strategy 2012-2020. The Agency for Promotion of Entrepreneurship (APPRM) carries out the implementation of some support programmes, based on an annual action plan developed in accordance with national and EU policy priorities. 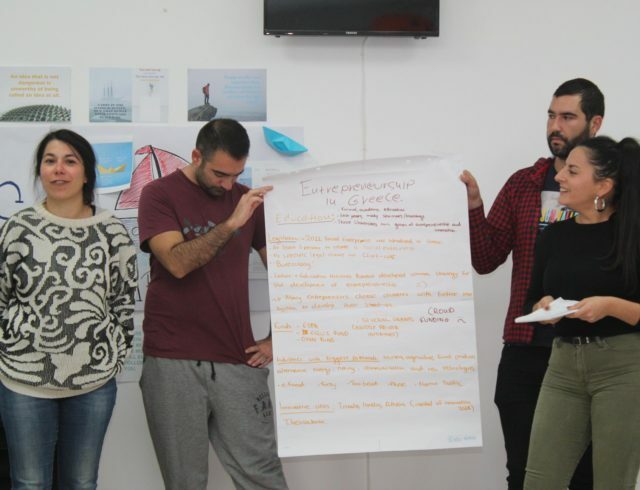 Entrepreneurial learning is high on the national policy agenda, with the Entrepreneurial Learning Strategy of Macedonia 2014–2020 developed to improve the entrepreneurial culture (risk-taking, innovation, leadership). The aim was to implement the activities through a multi-stakeholder partnership between public, private and civil society institutions. Entrepreneurial learning has been defined as a key competence objective for both lower and upper secondary levels. In September 2013, the subject of “Business and Entrepreneurship” was introduced as a stand-alone course in elementary, secondary and higher education. However, it remains a voluntary subject. Entrepreneurial education, on the other hand, is a mandatory part of the curriculum for all students, inasmuch as it is integrated into other core subjects, such as mathematics. The country stands out as one of the few in the region that has already carried out training on entrepreneurial learning for school leaders and teachers, and indeed it has plans to increase such training. 1. University Ss Cyril and Methodius, Faculty of Economics. 2.Faculty of Business and Economics – South East European University. 3. School of Business Economics and Management – University American College Skopje. South East European University has the main core entrepreneurship education. Young people have a lot of opportunities due to entrepreneurial education because there are a lot of public Universities with this education and the cost of studying is not high. The government supports start-ups with several grant and loan programs for unemployed people. The Self- Employment Program is jointly implemented by the Ministry of Labor and Social Policy, and the Employment Agency, with support from the UNDP. The program is part of the Operational Plan for Active Programs and Measures for Employment and Labor Market Services for 2017. – Grants up to 5,000 Euro for the unemployed who register a firm (10,000 Euro if the company has two co-owners). Grants are offered to the unemployed people registered with the Employment Agency who complete a training course and prepare a business plan. According to the annual report of the Employment Agency of Macedonia, 1,009 people have received grants to date. The work plan of the Employment Agency for 2017 assumes that the grant and training program will reach 1,050 unemployed. – Loans for registered unemployed people who are active job seekers and want to open their own business For small-scale activities, the loan amount is 3,000–9,000 Euro (3,000 Euro for each job created up to a maximum of 3 jobs). Due to the high unemployment rate is so hard for young people to take a grant. The struggle begins with the bureaucratic issues with documents and continues to corruption problems at different levels. 1. Name of the Company is Ecolog. Their programme is about scholarships. The Ecolog Scholarship Programme is a platform dedicated to young and intelligent individuals wishing to pursue a formal education within a specified area of study of importance to Ecolog business activities and the local society. In addition to Social Corporate Responsibility determinations, it is the purpose of this programme to support internal company capacity building initiatives and serve as a talent recruitment platform; allowing the company to recruit and shape talent in accordance with current and future company needs. 1′ Seavus Incubator Seavus Incubator is a multi-functional working space intended for tech start-ups and entrepreneurs, digital artists and online media companies. The pre-acceleration program of Seavus is a highly- intensive program dedicated primarily to business development issues. The program is six weeks long, seven days each week. The program is delivered by international mentors and local businessmen. The program ends with a “demo day” where the start-ups present in front of potential investors. Seavus incubator also offers co-working space for IT companies and mentoring services for its tenants. The pre-acceleration program is free of charge, while the co-working space is rented for 30 Euro per month. 2.CEED Hub Apart from the traditional services provided to MSMEs, the CEED HUB has, in the past three years, focused on developing and running two programs specifically for startups: • Pre-acceleration program: a “light” program that includes training and mentoring, as well as co-working space. It involves training and mentoring twice a week for three months, hence it is less intensive than the acceleration program. 3.Moznosti Moznosti Saving House has been in operations since 1996. It provides services to micro- small- and medium-sized enterprises that operate in trade, services and production, offering financial products and services such as loans and savings. It offers agricultural, business, personal and housing loans. Business loans of up to 50,000 Euro are disbursed to established businesses with a business track record. Moznosti does not work with emerging enterprises as they are high-risk ventures, and Moznosti does not have a sound methodology for assessing risk in these cases. It is also of the opinion that commercially-priced loans are not the best mean for financing start-ups. Rather, subsidized loans or other forms of ‘soft’ funding provided by institutions/entities prepared to incur financial losses would be more appropriate. 4.FULM FULM Saving House is a credit union which offers deposit and loan products. Since it began operations in 1999, the saving house provided over 25,000 loans. Loans of up to 5,000 Euro are disbursed to individuals and farmers for personal as well as business needs. Currently, FULM does not serve legal entities. However, recognizing the fact that many of the loans taken by individuals are used for financing business needs, it plans to introduce a new product: a business loan, which will be extended to established businesses as well as start-ups. 5. START UP MACEDONIA Start-up Macedonia Start-up Macedonia is an association created by a group of Macedonian start-up enthusiasts, experts, investors, start-up support organizations. This community includes start-ups, investors, FITD, consultants and innovators. Its main objective is to create a Macedonian start-up community to encourage and help start-ups to create a favourable environment for innovation. The organization, registered as an NGO, was formed by five enthusiasts. The aim of Start-up Macedonia is to become an umbrella organization for all needs that start-ups have. It promotes the entrepreneurial spirit, helps start-ups grow, encourages collaboration, provides access to international networks, promotes start-up events and provides legal support. The short-term goal of the organization is to map the start-up ecosystem in Macedonia, to identify the current issues that the ecosystem is facing and propose relevant solutions. The government, in cooperation with competent Ministries, is actuating start-ups and youth programs. Most of them are sector focus, and they are implemented in collaboration with third-party entities. Public entities (Universities, local institutions), or also privates, like foundation or companies. The Government aims to increase the policies for Startups, creating new tools to finance new innovative companies, The model to which the executive is inspired is the French one, where a highly profitable public fund has been created, which brings about 3 billion euros a year into the coffers of startups. According to data of former years, the cities where are present the biggest number of innovative startups are Milan, Turin and Naples. In these realities, the number of dedicated spaces and structure which invest in the innovation are hugely diffused. Mainly financial and mentoring for projects in the early stages. Usually, grants are provided for University teams who create projects based on KIS specifications (National Smart Specializations). A lot of interest is put on environment protection, artificial intelligence, the blockchain, healthcare. In the last few years, there were created over a dozen Science and Technology Parks (funded by UE funds) where business meetings are organized and young companies can rent office space. Unfortunately, there are still some problems with our tax system which for example does not understand new ways of funding such as crowdfunding. Therefore, the young company loses a big part of their income at the beginning, because the company does not generate costs yet. A lot of problems occur from a tax point of view when you try to commercialize R&D results and want to put it to the company (very unclear rules). But still, there are new reforms which the main point is to make it easier for young entrepreneurs to start their own companies for example reduction of the income tax from 15% to 9% since January 2019 for newly established companies. When you decide to establish One Man Business you are forced to pay social insurance (after 2nd year of activity about 300 Euro/month) even if you do not generate income. According to surveys, this is the main factor that discourages young people from establishing their own companies. Nevertheless, there is not too much help provided by the Education Ministry, commercializing academic research results is still very hard in our universities. It’s really hard to find this kind of school in Poland, which is focused on entrepreneurship and is established in Poland. We have a lot of economics universities. It is believed that this kind of school should prepare your people for business life. There are few branches of The Entrepreneurial School. It’s education initiative co-founded by the European Commission. We have entrepreneurship as a subject in a high school. So we start at a good time. But they are not in a modern way, the teachers often run the lessons in a very boring style. So if someone is not interested in the entrepreneurship, will not take anything from this. The best source of entrepreneurship knowledge we can distil from the Internet. Horizon 2020 – 50,000 Euros for a feasibility study (Phase 1) or from 0.5 to 2.5 million Euros for demonstration, research, development: technology/product/ services (Phase 2). Administrative difficulties, fear of failure, unpredictable economic situation. https://www.eurobank.gr/en/group/corporate-social-responsibility it’s about Greece just as an example of their actions. A technology hub for Central & Eastern Europe. They support bright minds from the region and Polish inventors and scientists living in Western Europe, help them to develop their technology in Poland and facilitate access to the fast-growing Polish financial market, modern laboratories, energetic start-up community and professional network in European and global markets. They offer financial support through Startup Hub: Poland Prize for the best startup ideas. Offer a Start2Star Scholarship for the secondary school students. Organize conferences, workshops and lectures whose speakers are the best specialists of the Polish and European markets. Promote the highest ethical standards and culture among entrepreneurs by granting special awards. Software that turns your phone into an HTC Vive headset. It streams the video from the commuter to the smartphone placed in the cheap VR goggles. Mobile app for banking and easy currency exchange. Also provides an easy splitting bill and much more. A top 1 place takes the city of Warsaw. It has a huge startup community and a fast developing market. Every year more and more people from all over the world arrive and settle down in Warsaw. The number of newcomers is constantly rising up. Meaningful worldwide known corporations establish their offices here, which gives an opportunity to access bigger chances of investments. It is also a capital for events, workshops or any types of meetings where you can make useful connections and broaden your knowledge in a specific sphere. Warsaw often appears in the world rankings of top cities where to start your startup. Besides, such cities as Wroclaw, Krakow and Gdansk are considered to be a good startup destination. Those are a bit cheaper venues, however, according to 2017 country research, they have the second biggest amount of start up communities in the country, after Warsaw. Warsaw Entrepreneur Social – a local group of people that meets every month to get inspired, exchange experiences and share knowledge about entrepreneurship and self-development. Foundation for the Development of the Education System – coordinates a huge amount of programmes co-founded by EU, for activities serving the development of education in Poland, including the entrepreneurial programs. Ashoka – an organization in supporting social entrepreneurship. They are continually searching for exceptional people with entrepreneurial spirit, individuals who use their ideas to revolutionize a particular sector and in doing so, solve the most pressing problems facing society today. The State Education Strategy 2013-2022 provides the strategic framework for the development of the education system in Lithuania. One of its objectives is to strengthen the “non-formal” education at schools, especially focused on leadership, creativity, entrepreneurship. It also aims to create a sustainable environment and conditions for the development of youth policy. Goals for this period include promoting youth employment, youth entrepreneurship and social entrepreneurship and creating more favourable conditions for these activities. „Benediktas Gylys Foundation” promotes entrepreneurship, science, creativity, free self-expression and tolerance since 2013. Global Leadership Conference – provides young people with lecturers like Simon Sinek, Danny Meyer, Carla Harris, Srive Masiyiwa and many more. „Kriptovaliutos.org“ – provides education about cryptocurrencies. „M Capital“ – makes workshops to educate about financial literacy. Gintaras Pociūnas – financial guide. Teaches about investing. Anyone willing to study business has the opportunity to study at a university or college. Examination results is very important that determine whether joining a state-funded or unfinanced place for admission. Lithuanian Labour Exchange (LLE) is an executive agency under the Ministry of Social Security and Labour. LLE is responsible for the provision of labour market services to jobseekers and employers and the implementation of active labour market policy measures. LLE provides two subsidies. First, a targeted subsidy is offered to youth entrepreneurs (or entrepreneurs with a disability) to support business start-up. The second subsidy is a small grant that can be used towards covering the costs of a business license, social security contributions or medical insurance.
) and Municipalities of Lithuania support youth entrepreneurs by providing grants through various programmes and incentives targeted to a particular purpose. StartupHighway financing program is strongly focused on the individual business needs of each selected startup. Aside from funding and other perks, StartupHighway sits together with the teams, studies the weak points, analyzes growth and scalability perspectives and makes tailored plans accordingly for success stories to happen. Nextury is a venture 3.0 style incubator building and funding startups around the hottest Silicon Valley tech ideas. Vilnius-based Nextury Ventures has invested in over 20 startups since 2014 and is constantly on the lookout for world-changing ideas and projects. Practica Capital is one of the most active and leading VC firms in Lithuania and the Baltics. Practica Capital is a dedicated Baltic VC investing in ventures, which have the ambition to become regional, international, global players or target leading positions in their national and neighbouring markets. BaltCap is the leading dedicated private equity and venture capital investor in the Baltic States (Estonia, Latvia and Lithuania). BaltCap supports strong management teams and companies with a vision to grow in the Baltics and beyond. LitCapital Asset Management UAB (LitCapital) is an independent professional private equity fund management company based in Lithuania. The fund was established under the JEREMIE initiative in cooperation with European Investment Fund (EIF) and is aimed at investing into expansion of private Lithuanian companies. Telia Lietuva, the New Generation Telco which is ready to venture into the universe of opportunities, excel in the world of technology and fulfil its dream of a perfectly connected tomorrow. Telia create solutions that enhance people’s everyday lives and offer growth opportunities for businesses. NFQ accelerates the success of entrepreneurs with a current team of 300 specialists delivering company-building services including strategy, engineering, operational scaling, recruiting, business development, product delivery, and product marketing. With more than 10 years of experience in eCommerce and Travel we provide technology excellence. Yellow hammack, Rise Vilnius, Sunrise Valley science and technology park. Name of the founder: Justas Janauskas and Milda Mitkute. Aim of the startup: To create a peer-to-peer marketplace for second-hand fashion items. Products/Services: An online marketplace and community that allows its users to sell, buy, and swap second-hand clothing items and accessories. Founders: Algimantas Krasauskas, Jurgis Pasukonis, Mantas Vizbaras and Martynas Gudonavicius. Aim of the startup: To make mobility services the first choice worldwide. Products/Services: A popular mobility app designed to help users devise the most efficient trips, incorporating all transport models using a powerful algorithm. Founders: Domas Labokas, Henrikas Urbonas and Simona Andrijauskaite. Aim of the startup: With only a laptop and internet access, enable any kind of audio stream to listeners’ phones or tablets via the mobile app. Products/Services: A mobile system that fully replaces audio streaming hardware for live events. Aim of the startup: To develop a marketplace for 3D models to reduce the cost of content creation, targeting professionals working in video gaming, augmented and virtual reality, 3D printing, and advertising. Aim of the startup: To create an alternative bank for the blockchain era. Products/Services: A bank for the blockchain era, offering loans and deposits. Founders: Erikas Treskovskis, Ivona Mikutavicienė, Andrejus Smirnovas and Daiva Staradumskyte. Lithuanian startup ecosystem had been expanding exponentially. Lithuania has many competitive advantages including location between east and west, highly qualified IT talent pool, operating cost advantages, as well as expanding and supportive ecosystem. According to Startup Lithuania, the country has been acting as a hotspot for local and regional startups. IT sector expansion facilitated the creation of new businesses and workplaces but also increased awareness of Lithuanian IT potential since Lithuanian startups were seen scaling up globally. Startup Lithuania believes that Lithuania has a perfect setting for IT sector to continue exponential expansion. Life sciences sector is the fastest growing in the EU. Annual growth reaches 25 %. Lithuania accounts for more than half of the global market of pico-second laserspectrometers. With 10% of the global market, Lithuania is one of the main exporters of femtosecond lasers systems in the world. Palanga, Klaipėda, Nida. These cities are located near Baltic sea and it attracts a lot of tourists. There is no current entrepreneurial learning strategy or curriculum that would support the introduction of entrepreneurial learning in the education system, and there is no support system for teachers in engaged in entrepreneurship teaching in Croatia. The Croatian Employment Service is in charge to offer supporting measures for youth via the youth centres, where job recruitment specialists are trained for effective communication with young people, group work and workshops for young people. Youth centres offer counselling and support in job search; active job seeking workshops; employment mediation; access to computers and portals to database of vacancies; publishing of the curriculum vitae on the portal called ”job market” [BurzaRada]; thematic lectures on important topics related to employment and information on active employment policies. The World Economic Forum notes in their study that the government can play a role in encouraging entrepreneurship, but many in Croatia feel the government has neglected to do so. In order to fill that void, startup accelerators like ZIP are aiming to provide training and mentorship for aspiring entrepreneurs — most of whom are under the age of 35 – in order to give more acces to entreprenorial education. Beside entrepreneurial incubators and development agencies, financial resources for young entrepreneurs are ensured by: 1. Croatian Agency for SMEs, Innovations and Investments (HAMAG-BICRO) through Financial instruments: guarantees and loans (programme EU Beginner), grants and innovation programmes Eureka. 2. The Croatian Bank for Reconstruction and Development, through the Entrepreneur Starter Programme for beginners entrepreneurs, Youth Entrepreneurship, microcrediting with the EU support and Free Zones, established by local and regional selfgovernment units with an aim to enable businesses to operate at much more favourable conditions. The Ministry of Entrepreneurship and Crafts through the programme E-impuls, which is the result of Croatia’s participation in European and Structural Funds, and helps micro and small enterprises to start up and expand their operations. The lack of a stable government considering that 59 percent of Croats think the country is headed in the wrong direction under the new government and also not having an entrepreneurial learning strategy, so that the population in not being informed and trained. 8. Few private companies that support entrepreneurial education through Corporate Social Responsibility programmes, hackatons, accelerators. Culture Hub Croatia – a mental workplace for interdisciplinary, intersocial and intercultural groups. Zagreb Hub – focused on initiating sustainable projects, whose main stakeholders can later manage them in a sustainable way. Vollo aims to provide the easiest way to search, compare and book bus tickets in Croatia. Search hundreds of lines, routes and connections and find best way for your trip. Vollo is Croatia’s leading online retailer of bus tickets. The Zagreb-based startup allows customers to travel smarter and save time, money and hassle. Vollo was officially founded in 2016. Its CEO Marko Jukic previously worked for Rocket Internet as co-founder and Managing Director of foodpanda in Azerbaijan. Canelio provides you with a smart device (clicker) and a mobile app, which will transform your dog’s training into a mobile game. Based entirely on positive training methods, Canelio acts as an universal communication tool between you and your dog. With countless videos and a personalized training guide the Croatian startup helps you to improve your training. Let your dog become a level 73 Puppy Sergeant with 12 achievements. Canelio was founded in 2015 and successfully took part in the most recent batch of the ABC Accelerator. 11. Top 3 cities who have an encouraging climate for entrepreneurs? Zagreb – the birth-place of many start-ups and hubs in Croatia. The small northern Croatian town of Ivanec was named by Financial Times’ fDi magazine as the No. 1 Micro European City of the Future for Investment. 12. 3-5 projects/programmes initiated by non-profit organisations with the topic: social entrepreneurship and entrepreneurial education. The ‘Children’s Week of Entrepreneurship’ is a grassroots initiative in Croatia, involving primary school and kindergarten children. The objective of the programme is to educate about the need for entrepreneurship education from an early age. The programme, running since 2008, was launched by the Ministry of Entrepreneurship and Crafts and is organised by the Education Group Zrinski with continued support from the Croatian government. The initiative has stimulated a number of schools to set up their own programmes, developing entrepreneurship clubs for children and collaborating further with businesses and other funders. The Turkish Entrepreneurship Strategy and Action Plan (2015-2018) developed by KOSGEB is one of the official milestone documents of the entrepreneurship policy. Similarly, the Strategy and Action Plan for Small and Medium Scale Enterprises is an important document in terms of enhancement of the competitive power. General aim of the Turkish Entrepreneurship Strategy and Action Plan (2015-2018) is to generalize entrepreneurship culture in turkey, to develop a strong ecosystem and to improve entrepreneurship. Entrepreneurship and Innovation Centre Established by Eastern Mediterranean University Business and Economics Faculty, the Entrepreneurship and Innovation Center, in collaboration with the Cyprus Turkish Chamber of Industry, has the fundamental aim of encouraging the industry, those involved in the industry, and the community towards entrepreneurship and productivity. In line with its aim, the centre endeavours to contribute to the country’s economy. established businesses more than doubled. Compared to US, Hungary, and Iran over the past six years, Turkey has the most stable and promising TEA. Enkuba is a start-up accelerator that helps creative entrepreneurs start companies building web and mobile-based products. Innovative Ventures Turkey is a technology accelerator and seed fund company, fully owned subsidiary of Sabanci University. Inovent’s focus is on the commercialization of early-stage technologies with a particular focus on fostering faculty based entrepreneurship. Iyzico provides a secure payment management platform to online companies of different sizes in different industries, including a virtual point-of-sale solution, a solution for managing marketplace payments, an online link payment service and a shopping service. Founded in 2012 by Barbaros Özbuğutu and Tahsin Isin, Iyzico has raised $24m in funding to date from investors including Amadeus Capital, Endeavor Catalyst, Speedinvest and International Finance Corporation. Modacruz is an online social marketplace that enables women to buy and sell pre-owned luxury fashion items. It has more than 1m users who purchase from millions of listed items. Founded in 2014, Modacruz is headed by Melis Guctas and last year raised $2m in a Series B funding round, bringing total investment in the company to $4.9m. Investors include Middle East Venture Partners, Hummingbird and Nevzat Aydin. Paraşüt is an Istanbul-based start-up developing a SaaS invoice and expenses management application to empower small businesses. The finance management platform was founded in 2013 and has gone from strength to strength since then, headed by Sean Yu. Paraşüt aims to offer basic financial information that entrepreneurs need in an easy-to-understand and actionable way. The company has raised $3.9m in investment to date from investors that include Diffusion Capital, Revo Capital and 500 Startups. The greatest number of early-stage entrepreneurs is found to be in the consumer service sector (46 percent), followed by transformative sector (34percent), while most established business owners are in the extractive andtransformative sectors (71 percent). 7. Top 3 cities who have an encouraging climate for entrepreneurs? Ankara also hosts Turkey’s largest industrial park, the OSTIM Industrial Zone, which specializes in small business trade, with 5,000 companies and 50,0000 employees covering eight main sectors. The Aegean Free Zone is considered the “engine of economic development” in the region, and is a commercial hub for Turkey. 8. 3-5 projects/programmes initiated by non-profit organisations with the topic: social entrepreneurship and entrepreneurial education. KOSGEB- ATILIM University Technology Development Center (ATILIM-TEKMER) is the latest investment of Atılım University which was established in order to provide an efficient environment for our students, academic staff and entrepreneurs who will work in the field of technology. (http://www.atilim.edu.tr/haber/kosgeb–atilim-universitesi-teknoloji-gelistirme-merkezi-tekmerkuruldu–3652). Being a concrete step for the university- industry cooperation, TEKMER aims at supporting innovative entrepreneurship and regional development.